Wednesday 30th November is a momentous day in the history of British Industrial Relations. Never before has Britain been faced with over 2 million workers collectively going on strike on the same day. However though the numbers are impressive, the cause which public sector pensions is very narrow in comparison to previous historic national struggles. The General Strike of 1926 involved approximately 1.5 million workers and went on for 9 days. Teachers stayed at home, shops did not open, chauffeurs refused to drive their masters’ cars, printers bar the government’s and the British Worker newspapers refused to publish newspapers, workers in all industry put down their tools. Their cause was the continued cutting of miners’ wages forcing hundreds of thousands of those “hard working families” politicians today talk about, into absolute poverty. British workers were so disgusted at the idea that rich, fat mine owners were willing to starve working class families for their own relentless pursuit of profit that as a national collective, the workers protested by taking solidarity strike action. As industry stopped, people still needed to be fed, energy was still required. Communities developed ways of looking after one another without relying on big industry or big government. A young upstart minister, one Winston Churchill wanted to send the army and tanks in, to force people back to work. As a junior minister his suggestions were ignored, the British Trade Union Congress, then closely controlled by Labour Party social democrats were worried that ordinary workers were becoming used to the idea of not needing money, or political parties but instead relying on themselves. After negotiations between the Conservatives and the TUC, they agreed that the workers had “made their point” but it was in Britain’s national interest that they got back to work despite no agreement was made by the mine owners to increase the miners’ pay, apparently there was a recession on, they guffed as they chomped through their cigars. Solidarity strikes or “secondary action“, the idea that rail workers could go on strike in solidarity with another section of the work force that was being unfairly treated, was a principal that was made illegal by Thatcher with the Employment Act of 1980. One day strikes are a real inconvenience and longer strikes can disrupt many people’s lives, however when Capital, the power of the 1%, destroys millions of livelihoods, media coverage is usually nonplussed. History has shown us that successive governments have been concerned with only broadening the Â power of Capital whilst simultaneously weakening the collective power of the 99%.Â The collective power of the ordinary worker in 1926 was voluntarily neutered by bureaucrats who had different interests to those who were on strike. I wonder if there are any lessons in that for the workers on strike today. How does Occupy London fit into this? Well those 2+ million workers who have used their democratic right to strike are part of the 99%. Their interests for decent pensions are part of our campaign against corporate greed and austerity. As the 99%, we could see every struggle against economic dictatorship as part of the broader struggle for freedom. Our Mubarak is the Market that can our income, delay our retirement age, triple our student fees, force us out of our jobs, take away our homes or even deny the right to a home and depose elected leaders of countries without any regard to us. 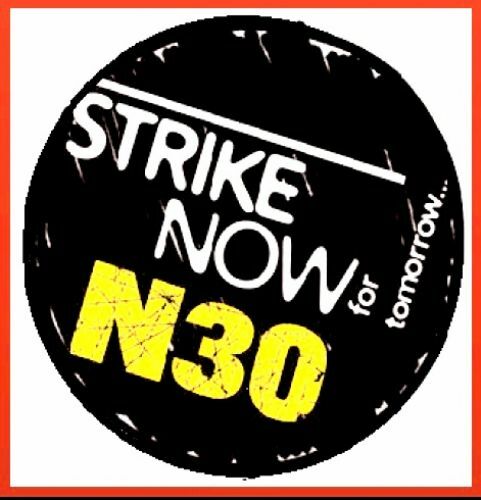 Let support this strike and all worker and student uprisings. We are the 99%.